Barbe-Nicole Ponsardin was born in December 1777 and was the daughter of a wealthy textile manufacturer and politician in Reims. Through her father’s political nouse and careful choosing of sides the family survived the Revolution relatively unscathed and in 1798 Barbe-Nicole married Francois Clicquot, whose family was active in textiles and wine. The young man was particularly interested in wine, and his new bride joined him in learning the business but they struggled to make it work. In 1805, Francois Clicquot died suddenly, leaving behind a 27-year-old wife, a young daughter and a failing business. The widow Clicquot, rather than withdrawing into domesticity or finding herself another husband, instead threw herself into the business, focused on wine production and changed the company name to Veuve Clicquot Ponsardin. “Veuve” being the French for “widow”. The task before her was daunting with the Napoleonic Wars raging across Europe, disrupting trade and flattening national economies. But her father-in-law believed in her and backed her with sufficient finances. Under her management and her skill with wine, the company enhanced the production of champagne using a novel technique called riddling. Prior to this invention the second fermentation of wine to create champagne resulted in a very sweet wine with large bubbles and sediment in the bottle from the remains of the yeast used in the fermentation. This residue resulted in the wine being cloudy. Veuve Clicquot’s technique still used the original English technique of adding additional sugar, but after this second fermentation was complete the bottles were held upside down. They were then turned a fraction each day so that the dead yeast would all gather near the cork. This is what became known as remuage (or riddling in English). 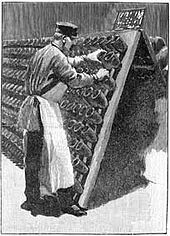 Once the settling was complete, the wine near the cork was removed and topped up with fresh wine to refill the bottle. The widow’s commercial breakthrough came in 1814, ironically with the defeat of France by the allied forces ranged against her. She managed to ship her 1811 vintage, regarded as the first truly modern champagne, to St. Petersburg where it was an immediate hit and opened the door to the Russian market which Veuve Clicquot would dominate for the next 50 years. Pushkin, Chekhov and Gogol all praised her champagne. The company went from strength to strength. 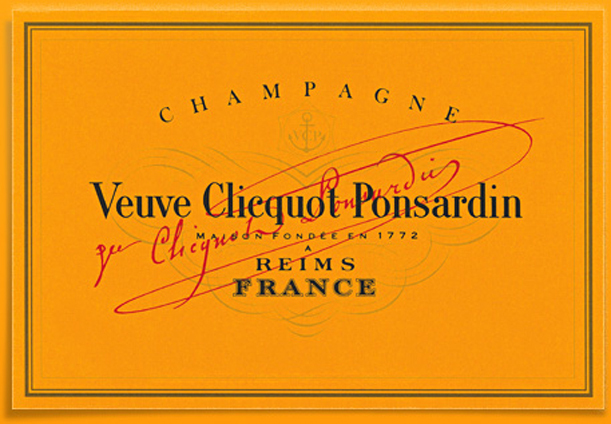 By the 1820s Veuve Clicquot was exporting 175,000 bottles of champagne a year. By the time of her death in 1866 the widow’s house was the largest champagne producer in the world. Now the company has a revenue of over one billion pounds a year. By way of a footnote, in 2010, diver Christian Ekstrom discovered 46 bottles of Veuve Clicquot near the Åland Islands in the Baltic Sea. The bottles had been lost en route to Russia, dated back to 1825-1830 and were likely made by the widow. They were remarkably well preserved due to the dark and cold of the seabed and one of the bottles was auctioned in 2011, fetching €30,000 which was a new record for a bottle of champagne at auction. One other bottle was chemically analysed and showed some interesting results. The level of sugar was much higher than modern champagne. There were also much higher levels of salt, iron, lead, copper, and arsenic(!) compared with modern vintages. The iron probably came from nails used in the wine barrels, and the lead leached from brass valve fittings of the winemaking equipment. It is believed the arsenic and copper originated from antiquated pesticide applied to the grapes.